Good Nutrition is crucial to health. Food plays a major role in how we feel and how we age. Making the correct choices about what to eat can improve your physical and mental wellbeing, and can help prevent certain medical conditions and manage disease. Because it can be difficult to figure out which foods make up a healthy diet, our registered dietitians help you create a plan that meets your individual health needs and goals. Nearly everyone can benefit from eating healthier. It is tough to improve your diet alone, so working with a nutritionist can assist you with your individual health and fitness goals. When meeting with a nutritionist, a careful review will be undertaken to determine particular information about your current diet and medical condition. The dietitian will work with you to formulate a plan that fits your needs, lifestyle, and budget. Your dietitian will also review your fitness level and make recommendations. Like your food selection, your individual fitness plan will help you achieve your health goals. You will receive help in establishing realistic short term and long term health goals. Together, you will develop behavioral modification techniques to stay on track with your nutrition plan. Our dietitians will be your cheerleader providing you ongoing encouragement and support through your journey for healthy living. 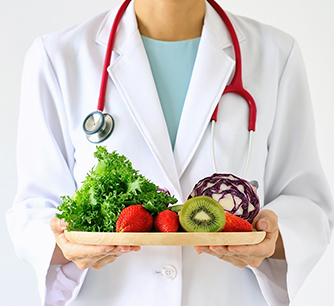 Virtually everyone could benefit from a dietitian’s guidance. They are experts in nutritional science and fitness. There is no one size fits all and together, you and the dietitian will develop a unique plan for life! To take the path toward healthier living, call 949.829.5533 or contact us online.